Don't be a tourist. Okay? San Francisco is too good of a city to miss out on the local parts. I've lived in San Francisco for five years. I'm an authority on the subject. Restaurants. Coffee shops. Concerts. San Francisco is my home. I feel that so deeply. I want to share that with you. You and this city deserve to know each other. SAN FRANCISCO. A WALKING TOUR. Bring walking shoes and layers. Really. This walking tour will take a good amount of time. Feel free to parse information based on your wants / needs. Also. This is a high level pass. We will deep dive on neighborhoods as this blog-space evolves. We're starting here because if you're from out of town, this is likely where you are staying. It's where all of the hotels are. No shame. However. This is a very touristy area. Enjoy the shopping and pancakes. Then head out into the neighborhoods. This is where the good stuff happens. Sears – the Swedish pancakes are what childhood dreams are made of. Get there early to beat the line. After pancakes, walk west on Sutter Street. You will start to feel the neighborhood vibe quickly. You'll walk for six blocks before you hit the pastry Mecca. This leg of the walking tour is purely in pursuit of the best pastries you've ever had. So save room at breakfast. If not, pack it for later. Spontaneous park picnics are always a win. 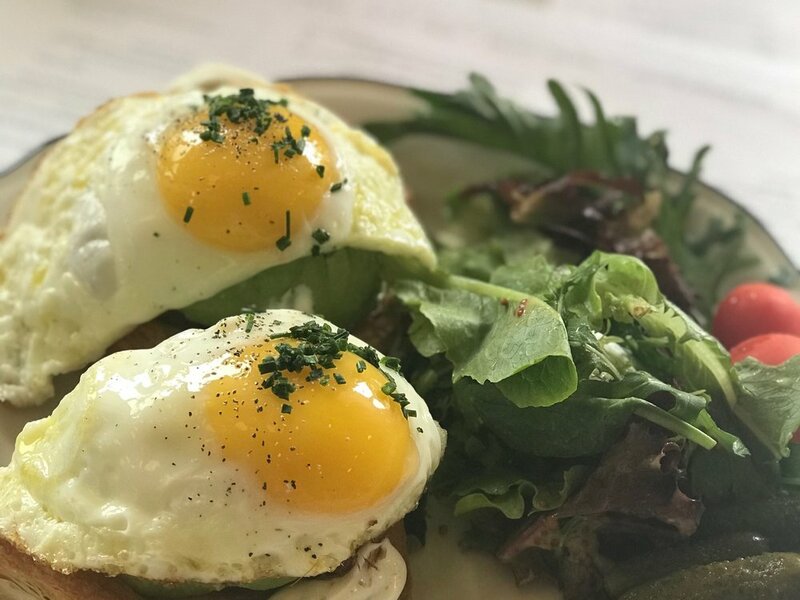 Jane – get the avocado toast. All options are good options. Mr. Holmes Bakehouse – CRUFFIN. There will likely be a line. Lots of good options if they are out. This area is gentrifying. It's still a little tender. Worth it. I'm into big churches. Grace Cathedral is the best of them. It's a special place for me and 100% worth seeing. Get ready to walk up hill. Walk up Larkin until you hit California Street. Walk east three more (uphill) blocks and you've made it. You can't miss it. It towers. Grace Cathedral – walk the lybrith(s). Don't be scared. There is one inside and outside. Walk around the top of Nob Hill. The views are great. Enjoy them! Bars: Top of the Mark. Polk street is one of the most local streets in the city. It traverses both Nob Hill and Russian Hill, two of the most coveted neighborhoods in SF. As you walk through you'll understand why. From Grace, head west back down the hill and find yourself on Polk St. There are options up and down Polk for whatever you are into. Here's a list of the highlights. Swan Oyster Depot – usually a line. I'll never forget watching Julia Child sit at that counter on an episode of her show, as a kid. "That exists in America," I thought. I was enchanted. Bobs Donuts – my fav spot for doughnuts ever. I wrote a whole post on it. We're in love. Common Sage Ramen – casual and easy ramen spot if you're on the go. Lots of cute shops like Picnic and Relove. Cheese plus – market-style store with sandwich counter-order service. This is a great spot to hoard some wine for that spontaneous picnic. Nick's Crispy Tacos – Mexican restaurant / wanna be club. Food is great though. Cash only. Blue Barn – sandwiches and salads. They are so good. Worth the price. Promise. Saint Frank – coffee. Great coffee. If you are interested in seeing Lombard Street, you're close. Head east on Lombard, from Polk Street, and keep walking up hill until you hit Hyde Street. If Ghiridelli Square is on your list keep trekking north on Polk until you hit Bay Street and head east. Buena Vista is also a fun stop in the area! Irish coffees for all. Bars: The Hi-lo Club, Shanghai Kelly's & Bullet. There are so many others good options. Make a turn west when you hit Untion street, on Polk street. You are officially venturing into "The Marina" as soon as you cross Van Ness. This is where you want to be. What you came for. Union is entertaining, with high-end stores, high density of exercise locations and a huge variety of food options. I find myself here a lot. Yoga Flow – this is my yoga studio and everything a yoga studio should be. Pin for later if you don't have time. Roam Burger – an SF local chain with great burgers (and veg burgers too). Marengo – great food + drinks. Date vibe type place. Chubby's – a San Francisco warrobe staple. The Bud Stop – Flowers. Not weed. charming af. Unami burger – bomb. The truffle french fries rock this world. Not "local" per say, but amazing. The Italian Homemade Company – death-by-homemade-pasta-happiness. See – a glasses shop. Something different in the eyewear scene. ... and too many cute shops to list. This is a window-shoppers dream. Enjoy. Bars: Brickyard, Blue Light, Hollow Cow & Bus Stop. Head north on Filmore street and then down to Chestnut street. On Fillmore, check out Pizza Orgamica and Tacko. I know. The chances that you're still hungry are slim. Just sayin. There are a handful of bars on Fillmore. Stop if you're feeling that drink. Mauna Loa is a great choice. Once on Chestnut, take it all in. Quaint and charming, yet brimming with the good things in life. This was worth the walk. Chestnut street is a true San Francisco gem. Blue Barn (another one) – sandwiches and salads. They are so good. Worth the price. Promise. Le Maris – decedence in the most refined way. You'll salivate when you walk in. Delarosa – highly suggest the burrata appetizer. It's perfect. Tipsy Pig – for food or drinks. And again. So many shops. You could spend a whole afternoon here. Bars: Horseshoe Tavern, Campus & California Wine Merchant. Chestnut street takes you to the Presidio (home of Lucas Films) and gets you very close to the Golden Gate Bridge. If you're up for more, I suggest walking down to Chrissy field. You can feel the grandness of the Golden Gate in a way that is magic. This is a perfect place to enjoy any food and drink you've been hoarding. Hello sand bluffs. When you try this, I'd love to hear from you. When I feel low, this walk is a haven for me. It's provided me a lot of clarity over the years. And for you, it's a great peek into real-life San Francisco. Seeing this place like a local will be so satisfying. Promise. Enjoy. Happy to answer any questions you have. All of the best places to eat on Divis and Lower Haight. A walking tour of San Francisco. Union Square. Lower Nob Hill. Grace. Polk. Union. Chestnut. I. LOVE. SF. This is a love story. It's about deep fried pastries and fated love. A neighborhood guide to the Lower Nob Hill. Dedicated to proving that dreams come true. You can have what you want.